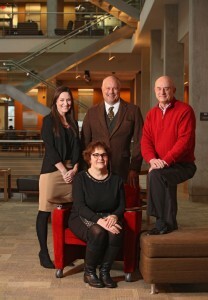 The Higher Education Center Leadership team: Standing (left to right) – Kristin Dahlquist, Program Manager; John Clapp, Director; Ken Hale, Associate Director. Seated – Connie Boehm, Associate Director. College is a seminal time in a young person’s life. It’s a time for intellectual and social growth. It’s a time for the formulation of passions and future professional pathways. It’s an exciting time of experimentation, but there are also hazards on our campuses that sometimes derail students and disrupt the attainment of their great potential. High-risk drinking and the misuse of drugs are among these critical hazards, and our colleges and universities understand the need to create safe environments and educate students about the dangers of alcohol and drug misuse. The new Higher Education Center for Alcohol and Drug Misuse Prevention and Recovery has been established at the Ohio State University to support colleges and universities in this important work. This partnership between the Colleges of Social Work and Pharmacy and the Office of Student Life provides education and training, research and evaluation, technical assistance, and technology development to help colleges and universities prevent drug and alcohol misuse. We also have a strong emphasis in supporting the establishment of collegiate recovery communities. well. The Center is developing myriad resources to help college and community leaders develop, implement, and evaluate programs and policies to reduce problems experienced by students related to alcohol and other drug misuse. A few examples of these efforts include the provision of educational webinars and development of innovative tools for screening, brief interventions and referral to treatment (SBIRT). The Center’s website is being established at HECAOD.osu.edu, and you can follow HECAOD on Twitter, Facebook, and Instagram. Make plans now to join us at the inaugural Higher Education Center for Alcohol and Drug Misuse Prevention and Recovery National Meeting, August 4-6, 2015, at Ohio State’s Blackwell Inn & Conference Center. 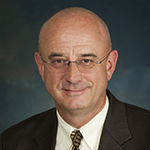 Dr. Kenneth M. Hale is Associate Director of the Higher Education Center for Alcohol and Drug Misuse Prevention and Recovery. In our local paper a mother grieves the loss of her college son who has died due to a combination of abusing alcohol and one of the popular ADHD stimulants. The official cause of death is listed as alcohol toxicity in the coroner’s report. Apparently what happened is while the student was devouring significant amounts of alcohol, he was also snorting the prescription stimulant at the same time. This allowed him the ability to ingest more alcohol than he could have normally consumed, due to the stimulant effect of the pharmaceutical. He simply was not obtaining the true impact of the amount of alcohol he was taking due to the stimulant impact. However, once the alcohol blood level reached a certain point, even the stimulant could not keep him from a tragic death. The stimulant was obtained either from a friend or dealer and, of course, is relatively a common method to be able to drink more at parties and other social events college aged students attend. Although pain relievers still rank the highest in college student abuse among pharmaceuticals (RADARS® 2014), the deadly combinations of stimulants or benzodiazepines mixed with alcohol may be just as dangerous. Perhaps the most important thing lost in this article was that it seemed to consider the consumption of large amounts of alcohol to be the rite of passage for college students, with the true villain here being the prescription stimulant. There is probably no doubt that the student would not have died without taking the stimulant with the alcohol, but the opposite would also likely be true. In 47 years of law enforcement I have seen the devastation of alcohol abuse. In my opinion, alcohol has caused more collaborative damage than all of the other illicit drugs combined, yet with it being legal, I think we all tend to consider it somewhat benign. Of course, taking alcohol in moderation with some common sense, as it is by many, can deter negative things from happening. Prescription stimulant abuse is nothing new, as it has been used by college students for decades in order to focus on their studies. Much of the abuse we see today of these drugs comes from the parents of young ADHD patients who abused them in their college days and now see a readily available supply in their own children’s prescription. The parents may decide to suspend the doses for the child during summer vacation, but continue to refill if for their own use. The ample diagnosis of ADHD, and even the strong suggestion of some elementary schools that particular students need to be prescribed the drug before returning to class, helps to fuel the availability of these drugs in America’s medicine cabinets. 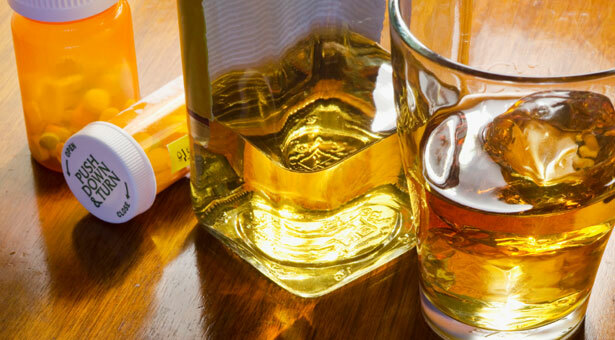 Alcohol and the combination of many illicit and pharmaceuticals can be a recipe for disaster. Knowing the dangers of stimulant prescription drugs and alcohol combinations is something all college students should consider before a night on the town. Commander John Burke is president and owner of Pharmaceutical Diversion Education Inc. (www.rxdiversion.com) and president of National Association of Drug Diversion Investigators (NADDI) (www.naddi.org). He has served as a law enforcement officer for more than 45 years.